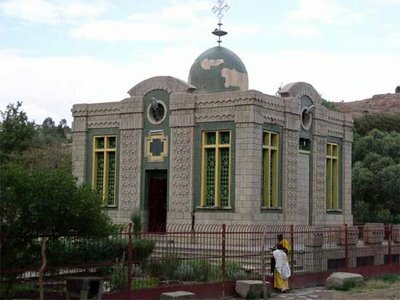 The Chapel of the Ark on the grounds of the St. Mary of Zion Church in Aksum, Ethiopia. The story goes that King Solomon and the Queen of Sheba produced a son together: Menelik. Years after the Queen's visit that was recorded in scripture, Menelik came to visit his father and it was at that time that Solomon let Menelik take the Ark of the Covenant to what is now Ethiopia. There the Ark was kept by Menelik's descendants and when Christianity arrived over a thousand years later, the Ark came into the custody of what today is the Orthodox Church of Ethiopia. For the Christians of Ethiopia, the whereabouts of the Ark has been no real secret. It used to be brought out on certain religious occasions (always covered with a thick shroud) and kept in the St. Mary of Zion Church. Then in the 1960s the chapel that you see in the above photo was built and the Ark moved into it. 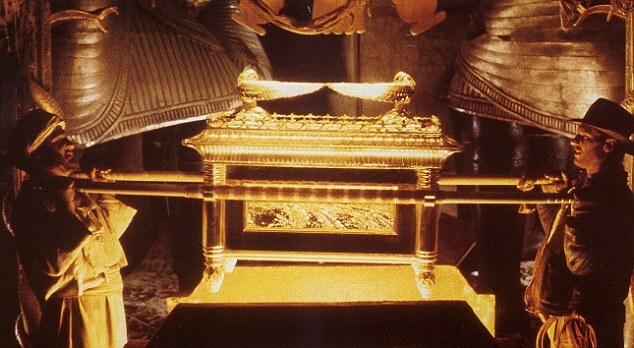 Only one man is allowed to see the Ark of the Covenant itself: a "guardian of the treasure" who is appointed for life to keep the Ark safe from harm. Before the guardian dies, he chooses a young man to be the next to watch over the Ark. So it has gone for generations. The guardian never leaves the chapel, and no one else is allowed inside. But now, the entire world might be about to see the Ark of the Covenant... all because of a leaking roof. Rain water is now trickling into the Chapel of the Ark. A new temporary chapel is being built nearby to store the Ark while repairs are being made. And moving the Ark requires four men to pull it off. That's if the instructions found in the Bible are followed, anyway (which they should be, because both Bible and Hollywood warn about nasty things happening to those who would locate the Ark in anything but the prescribed manner). 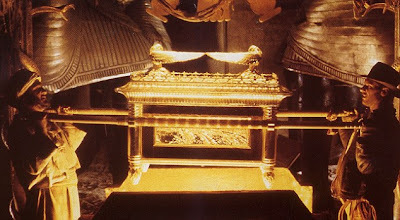 There are two photographs of the Ark of the Covenant that I'm aware of. One of them was taken in the Fifties or Sixties and shows the Ark outside during a religious festival, completely covered. The other one shows a group of monks carrying a shrouded Ark with their backs turned toward it out of respect. There's something there, all right. And whatever it is, it might very well soon be all over CNN and YouTube.